Decal Choice: --Select--Code A - 6.25"x 2.375" Code B - 5"x 2" - Subtract US $1.00 Code C - 8"x 3" Code D - 8.1875"x 3.125" Code E - 5.1875"x 2" - Subtract US $1.00 Code F - 6.312"5x 2.375" Code G - 6.0625"x 2.3125" Code H - 4.125"x 1.625" - Subtract US $2.00 Code I - 4"x 1.5" - Subtract US $2.00 Code J - 3.8125"x 1.4375" - Subtract US $2.00 Code K - 4.875"x 1.875" - Subtract US $1.00 Code L - 12"x 4.5625" - Add US $5.00 Code M - 8.25"x 3.25" Code N - 6.375"x 2.375"
Detail your Ford truck or SUV with this themed Patriotic US Flag decal that fits perfectly on the oval factory emblem of the vehicle's front grille or rear gate. The decal is uniquely designed so that it fits on the Blue logo area, leaving the emblem's Chrome trim to outline the new decal as shown. 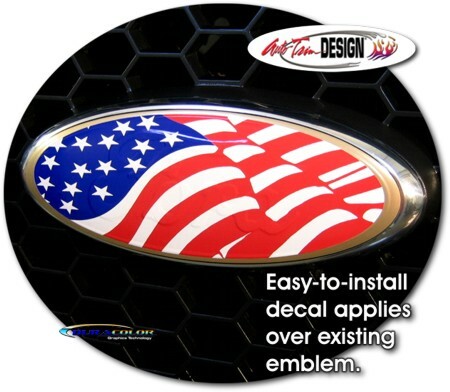 This decal product is manufactured from premium cast adhesive-backed automotive grade vinyl materials with an image that is thermally printed to the surface with our DuraCOLOR Graphics Technology. Please Note: Newer Ford oval emblems feature embossed "Ford" lettering. Thus, the embossed area(s) of the logo may show through the decal slightly.